Dubbed the '284' this cam was developed for classic/historic saloon car racing where the car is carrying quite a bit of weight and is especially good where twin SUs have to be used. Independent dyno tests by Richard Longman & Co concluded it was the best available race cam at the time of testing. The relatively short duration gives plenty of torque, rapid acceleration yet surprisingly strong top-end. Will pull strongly from 2,500rpm to 8,500rpm if required. Best performance is in the 3,000 to 7,500rpm power band. Requires block boring/reaming out to take larger diameter cam followers. 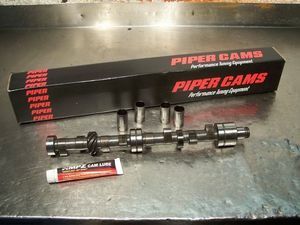 Kit contains cross-drilled camshaft from a blank, larger diameter cam followers, cam lube, valve springs and installation instructions.